I have a few more thoughts about DC's Before Watchmen project. The cycle of DC Comics mini-series based on characters and creations of Alan Moore and Dave Gibbons in their award-winning late '80s graphic novel finished its initial serialization several weeks ago. It has since moved into the hardcover trade availability phase of its publishing life cycle. The project made this transition without a great deal of attention or hype. There was certainly nothing to match the intensity and buzz of the original series' last issue nor did we see a sequel to the furious back-and-forth that came with the announcement of the new books' publication. The last comic book to be published was even slightly out of order. A once-promised final wrap-up issue was abandoned somewhere between idea and execution. The new trades are handsome but were not mentioned to me by a single person at Comic-Con International as something they were reading, anticipating, or even looking to buy. I've already written on Before Watchmen. I consider the following a companion piece to this essay. That is a grander essay. As it was written with the kind of anger that makes you focus, it is likely more right-on than the following summer reverie has any chance of being. I stand by the content of everything I wrote in that one, urging only that everything I wrote be considered in its appraisal. There are additional things to be said, however, upon the project's completion as a serial work and its move into this new phase. Let's try five. As predicted, the furor over the Before Watchmen project became part of the hype cycle for the project as both a publishing effort and a wider, corporate strategy of property management and career advancement. It was at the very least exploited as such: I know I've seen my fair share of "controversial" designations accompanying various press efforts on behalf of the books. 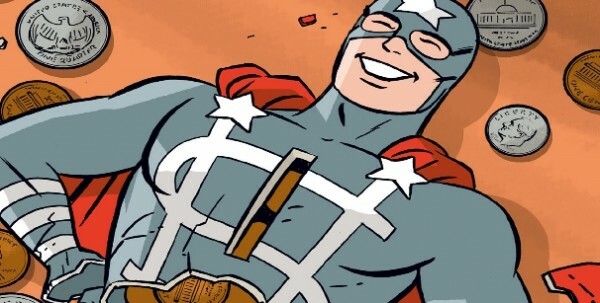 That said, I am convinced there was significant value in a huge swathe of comics professionals and devoted readers using the publishing event as a springboard to talk about issues of creators rights, the expectations we have for corporate behavior, and the choices made by creative people. I think that's a positive no matter the end result of these conversations. I don't believe this discussion was limited to twitter and a few message boards. I suspect it was a sprawling affair and will continue for a long while. I know that I encountered fevered talk about this topic in bars and on the phone and via e-mail months and months into the series itself. I spoke to someone at length about Before Watchmen while in New York City a full year after the project was announced. It was referenced in a panel I moderated this year at Comic-Con International. I believe it is precisely because people are wrong about the immutable nature of corporations as policy-shaping entities, and because human decisions really do matter, that it's worth having these discussions whenever and wherever we can. That we're nearly a quarter-century removed from the last flurry of talks on these matters made it absolutely vital to revisit these conversations in a significant way. We live in a very different world now in terms of what we tolerate and what we have come to believe is not only possible but a "right" to be exercised -- by individual artists, corporations and consumers. Before Watchmen has helped a lot of us sort the players and the possibilities. I hope the conversation continues. Many of the weaknesses of the current professional community and those groups' attendant pathologies were on full display over the last year or so, particularly in the three or four months after the initial announcement. The most worrisome trend to my mind was a too-easy conflation between supporting a policy or business outcome and supporting the creator that makes them. That several creators and their proxies saw the criticism of Before Watchmen as a personal attack suggests a greater embrace of the idea that we have personal brands, a business-operation conception of ourselves as creative people that fosters binary relationships: we are either supported or assaulted. It behooves us to get to a place where someone sees a criticism of a policy or outcome as something other than something aimed at their inner being, or praise for a comic book or professional stance as something other than an overture of lifelong friendship. We should have a greater conception of ourselves as people, as creators and as a professional community than as a collective jumble of personae in various stages of getting over. 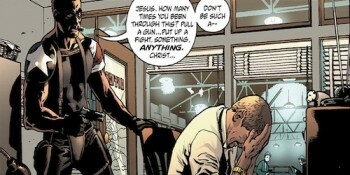 The critics of Before Watchmen, myself included, were frequently sanctimonious, arrogant and cruel. One way I think this was displayed came about as an unfortunate result of the Internet-based, transactional culture that serves as the vehicle for a huge portion of these discussions. There's so much equivocating and jockeying for favor in a shared space like the comics community's on-line sphere that stronger statements tend to be rewarded. You're more likely to traffic in the currency of attention that serves as a reward on-line if you state that something is flat-out evil than you are if you parse out the good and the bad, the horrifying from the simply unfortunate, the execrable from the rote or dull. I think you see the danger inherent in this kind of thinking in the way that arguments around the treatment of Jerry Siegel and Joe Shuster have developed. If your arguments for better treatment of those creators and their families depend on Superman's dads being wholly-victimized young people that only ever made $200 from the character and due to the aggressive depredation of evil businessmen became the kind of sad individuals that might try to borrow money from you in a public toilet, to find out that that pair made some bad choices, to discover they spent a great deal of money after making a not-insignificant amount, and to learn that family members sometimes wanted more than was allotted them and expressed this in indelicate terms, this is all going to be an assault on a precarious position you've embraced without really needing to. You've sacrificed a much more powerful and positive stance -- that we can do better by the creators of this marvelous and wealth-generating character -- for an extra three percent of rubbing someone else's face in something. So yes, there was a flip side to some of the astonishingly unkind statements made by some creators involved with the project, and the generally crass underpinnings of arguments used in its defense. Just about everybody involved got a chance to say something that may cause someone else to cringe. That's not to draw moral equivalencies between any sets of positions. It's to point out that expressing these issues in total, pitch black and blinding, bright white is in service to sentiments and strategies that may have little to do with clarity and rational thought. They may be satisfying, but we rarely learn anything. Let's work towards a greater and more generous conception of the truth. Yes indeed, Alan Moore and Dave Gibbons failed to sign contracts that match up to what we might hope for someone to sign given the clarity of hindsight and our ability to make fictional versions of ourselves suffer the hardship of choices we never have to make. Moore and Gibbons also sometimes make comics that aren't awesome. Moore in particular is given over to occasional, ungenerous statements about fellow artists. Moore also looks odd, and has views on religion that can make him seem a strange figure. Watchmen itself is a book a number of folks believe is great but it's not a perfect work; there's no reason to think it can endure a thousand small cuts and indignities and maintain the power it once had. We don't rightly know the pressures felt by the individual creators or even by the executives involved to work on these prequel books. I know I've done some things that weren't optimal because of pressures internal and external. I assume you have. We should extend that potential point of sympathy to our comics makers whenever we can. There were some positives to Before Watchmen as well. Those books employed a lot of creative people including some of whom I'm fond. I'm certain Before Watchmen made some money for shop owners that have a tough row to hoe generally. Some of the creative efforts were laudable. I thought Amanda Conner's art on Silk Spectre was an eye-opener; I have no idea other than maybe speed issues why she isn't rotated in on major books with that company. Darwyn Cooke falls out of bed making entertaining and fun-to-read comic books, and his solo work here was compulsively readable. Jae Lee's art on the Ozymandias series was lovely in a lot of ways, and any way it wasn't, Steve Rude's art turn on a Dollar Bill one-shot was. Len Wein let folks know there's no reason we shouldn't be reading more comic books by Len Wein. So yeah, there was some okay stuff in there. I thought some of the comics were lousy and unimaginative, too, and some of the creative contributions either unfocused or outright cynical. I thought some of the comics dragged on for much longer than paper-thin plots demanded. I thought as a whole they were at best pretty ordinary DC Comics of the last twenty years variety, despite several flourishes of craft and the underlying strength of some of the character designs and concepts. The Before Watchmen comics frequently felt as cobbled together and furiously last-second as rumors had it they were. They felt like assignments. Nothing about anything that was good in those comics depended on mining Watchmen. There was a better outcome for Watchmen than Before Watchmen. You don't have to argue the 100 percent failure of something in order to be critical of it. High moral certainty dependent on an overlay of fantasy sounds like a worldview that the original Watchmen would pull apart and criticize. We can have better discussions, talks and debates where the end result is more significant than winning a point by shouting the loudest and saying the most nasty things into empty space. We too frequently settle for spinning around and accepting some high-fives when the point should be to educate each other and change the way things are done. We are a clever people, and there is room to argue about things that falls somewhere between slamming the recently deceased and a kind of imperious "you're with me or against me." There is a better outcome for the comics industry than Before Watchmen. I do think these books, like the movie version -- which I thought a ham-fisted misfire and unintentionally funny throughout, although also with a few laudable moments of craft -- will have an effect on how many see the original work, if only by setting up in close creative proximity to that work. When the original work asks a question, and we've been given an answer elsewhere, it's almost impossible not to at least remember that answer. It's a risk of doing that kind of art. I never wanted to know what happened to the characters in The Last Picture Show, but I have a sense of it. It's Hayden Christensen under that black helmet. Jake Gittes will recover from the ending of Chinatown to eventually get hired by Jake Berman. TS Garp looks like Robin Williams, at least a little bit, and the Comedian played touch football with the Kennedys. One surprising thing about Before Watchmen was how badly the needs of these series were served by what Moore and Gibbons did in the original work. Characters created for a novel, or a specific story, no matter how entertaining, are not necessarily fodder for franchise creation. 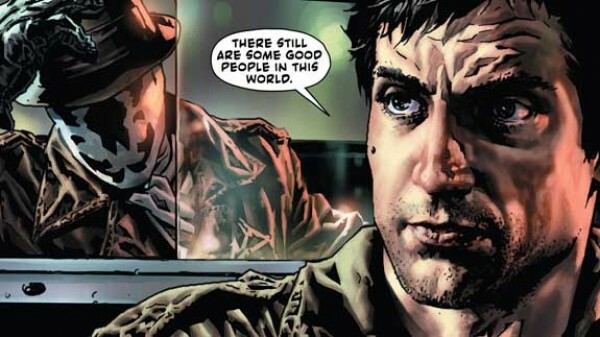 Unlike characters such as Superman and Sherlock Holmes, whose reasons for being are tied into pretty basic themes and concepts, the Watchmen characters were more complicated creations that refer to older comic books as much as the broader concepts behind them. These characters really only fully exist in the realm of that story; they are elements of that story. When people point out in the ongoing game of Internet Gotcha that Moore and Gibbons considered outside projects once upon a time, they miss the wider point that in the end these never fully materialized, and that this was a positive. It would take a much grander and more clever project than this one to repurpose these characters in a way they have anything close to the full impact they fostered in the original Watchmen. It's something an Alan Moore might have been able to do, but even then I'm not so sure. It's hard for me to think of any of the characters that came across as more compelling for there being Before Watchmen than as they existed in the original book. 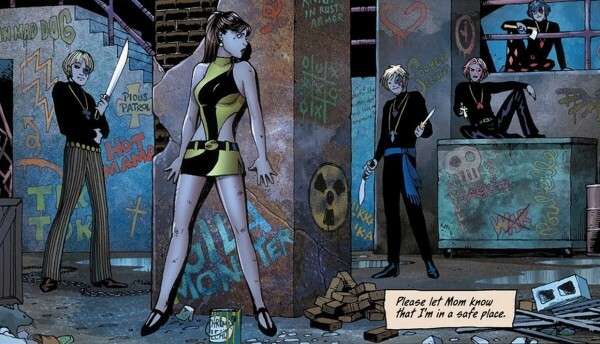 You might be able to make that case for the second Silk Spectre character, as I'm sure some people found that character more appealing in the Cooke/Conner series than they did in the original work, but I'm not sure more appealing equates directly to better and those takes are so fundamentally different that it could have been someone else entirely. That would still be a rotten batting average. No, Watchmen works as the whole it was intended, and pulled apart it was so many metal parts on a stretch of black velvet. You could see them, but they hardly moved. Give me the watch; let the rest scatter to the floor. We forget sometimes that part of the graphic novel revolution wasn't just about getting the medium over with a different audience or some rough idea of being taken more seriously, but about a range of expression through that forms that yields an effect denied serial comic books and their undying, continually-published nature. I think in addition to hundreds and hundreds of individual artists and creators and industry people confronting on their own terms what they think about these matters, the general context has changed for similar projects and situations heading forward. Those that push back are going to push back even harder now. In the same way the industry and the art form benefited significantly by certain creators washing their hands of the 1980s mainstream comic book industry as much as they could in the wake of Marvel's conduct concerning Jack Kirby's original art, the industry and the art form will be changed by the decisions made by creators as to how to orient themselves to the kinds of businesses according to how they conducted themselves with Alan Moore. This is true of those that broke with that kind of work entirely -- the Chris Robersons and Roger Langridges -- and those, I think more significantly, that began to plot a career strategy other than commitment and trust in corporate entities. Image Comics, the second-tier mainstream publishers and even Marvel may be the biggest winners where Before Watchmen is concerned. I think this is where the break with past policy weighs in, the notion that even something so long ago accepted as a status quo, as was the case with the DC impasse with Moore and Gibbons on Watchmen material, can change when the companies change. You usually see this in a positive way, actually, when it's argued that present-day companies are no longer directly responsible for things done years ago by previous regimes and should be given the benefit of the doubt. And it's true that the deals and respect afforded modern creators can sometimes dwarf that of what was given to creators fifty to seventy years ago. The flip side of the horrifying arguments that corporate entities are somehow agents of their own and operate independently of the men and women that make them up is a sense of real-politik about the nature of the scorpion swimming on a creator's back. One reason we find things like Before Watchmen dismaying is that so much of what's been great about comics in the time since the original series has been partly the result of contracts that wouldn't allow this project to happen. And now that there are more models that are profitable within that realm of comics making, more of the best creators should move in that direction. At one point it was suggested to me that it was weird to read site after site, many of whom do not pay their contributors or who pay them very poorly, hammer comics pros and companies as being exploitative for an endeavor where those involved were relatively very well paid. Ditto criticism over industry practices that made the project possible from entities that also utilize work-made-for-hire. And you know what? I think there's something to that. I'd suggest that Before Watchmen and the discussions that followed did a lot to throw the spotlight on how comfortable people have become in treating artists less than optimally up and down the entire spectrum of comics-making. Certainly the level of collective comfort with exploitation at the high end of media creation plays a significant role in how we consume the resulting art. I think that's a big driver when it comes to herding those arguments into the most narrow, legal terms possible -- which is a fine stance, except that when creators attempt to employ the legal mechanisms available to them it's suddenly seen in a different light by many of those same people. Corporations being aggressive using the law, well, that's just what corporations do. A family trying to secure a greater legacy for their patriarch using the same laws, that's greed. A corporation trying to curry favor in the professional community is a breath of fresh air; a creator trying to sow the seeds of dissent against certain publishing practices, that's just sour grapes. Comics people are major sensualists, and god help any construction that stands in the way or threatens to complicate our unfettered enjoyment of something we love. My feeling these days is that comics is soaked in exploitation, and that this deserves to be confronted in every corner of the industry. We should do this not as a way to excuse or legitimize the more egregious instances but because 1) it's usually always a bad thing, 2) we might learn of specific instances that can be treated or helped in a way that the grander examples cannot be budged, 3) one way to change a culture is to change some of the culture with an eye towards the rest of the culture following suit. To make things perfect is usually impossible, and there's a self-indulgent aspect to screaming at the weather. To make things better is continually possible, and can start with your own actions. It's also a lot more difficult. We should pay people. We should not except in rare circumstances own anyone's work but our own. We should not assume a universal currency where exposure and training and team-building are equal to pay and prestige and positioning. We should not utilize anything anyone creates outside of the terms they establish for it or that the entity to whom they cede control has established. We should not participate in mechanisms that encourage these practices. This isn't moral browbeating. CR has done a terrible job with this in the past, and will likely struggle with these issues in the future. We can all do better. If enough of us try, if enough people put aside the idea that our own success has moral force, then some will succeed at treating creators and other makers with greater respect and to greater reward. I would also love to see a broader discussion of whether or not it's worthwhile for anyone to go to a publisher and take a less than optimal deal. That includes all of the publishers, not just the ones that publish comics CR readers don't like. That includes the fairness of a limited return on the time and effort spent, not just ethical misfires in contractual language. We need a realistic dialogue as to the fine line between helping people and enabling them. That can be exploitation, too. I'm not sure we even have a broad idea of what a good deal is supposed to look like. We also might begin to question our consumption of art and make more informed choices as to what we're buying and how and how that has an effect on the creator involved. That doesn't mean you have to join Steve Bissette in his boycott of all things Marvel, or purge your hard drive of the 500 movies you have on there (although seriously, maybe it's time we purged our movie hard drives), but I hope that if you're the kind of person that reads a giant essay on a comics commentary site that you have a semblance of the same sophistication with your buying habits that Bissette brings to his own. Embracing the consequences of our own behavior is one way to fight against the notion that we're all victims scrambling in and out of the feet of major corporate entities that matter. Making a few changes doesn't mean that you'll succeed, and almost no one is allowed a lifetime of optimal choices. I'd consider writing work-for-hire comic book scripts on Jack Kirby's skull if that were the only way to help a family member or a close friend. But doing better shouldn't be about maintaining a perfect record so as not to receive grief on the Internet from someone playing the hypocrisy card. It should be about a collective effort to form a basic standard that favors the best possible outcome for art and the people that make it as opposed to relegating all of that to secondary status behind what's allowable, what someone or some collection of force will allow us to do, what we can eke out, what we can justify by plugging it into our personal stories. 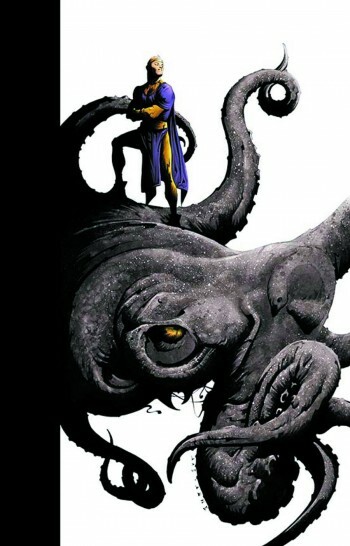 I doubt I'll ever be convinced that Before Watchmen was an awesome project. I don't think it was evil; I think it was sad. That was a lot of talent aimed at books whose nature allowed only the tiniest chance that remarkable art would result; talent that probably could have gone to bolstering the new superhero comics line or that could have been pushed in the direction of their own, similar achievement. So much of it smacked of parody -- they really did a Dollar Bill comic book! 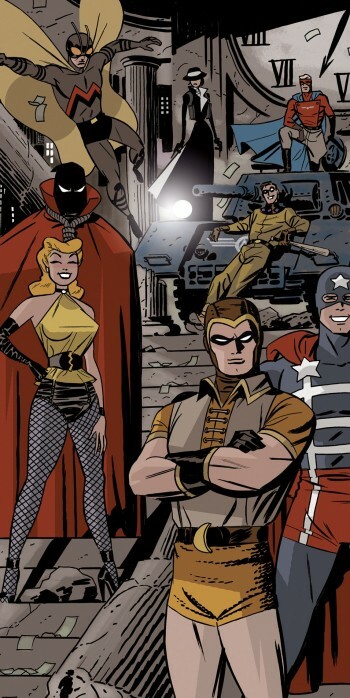 With Steve Rude art! -- that the whole thing was hard to fathom. The result was an all-time target-rich snark environment, and it's still difficult to grasp just what snapped in the way comics approaches such matters that it was suddenly here in our midst. Hopefully, we learned something from it, from all of it, and the better outcome here will mean more of us come around to the notion that all the hot air in the world matters less than a concrete step in a forward direction. Comics' famously low threshold for participation is an opportunity and a responsibility; we should see to both. The best legacy imaginable for Before Watchmen might be a generation of spiritual sequels and passionate discussions and applied industry practices whose connection to this misguided project is felt, never seen.